Please note: Investors should be aware that past performance should not be considered a guide to future performance. Benchmark: Prior to 01.04.2013 FTSE EPRA/NAREIT Developed Europe Index (Net, GBP). 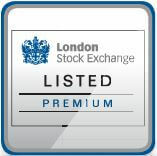 Prior to 01.04.2012 FTSE EPRA/NAREIT Developed Europe Index (GBP). Prior to 01.04.2007 S&P Citigroup European Property Index. Prior to 01.09.2001 FTSE Real Estate index. Source: BMO Global Asset Management, Lipper.